During the sunnier months, I enjoy going to the farmers markets for the usual reasons: local produce, supporting small farms, and all that. Up until last year, they shut down during the winter. 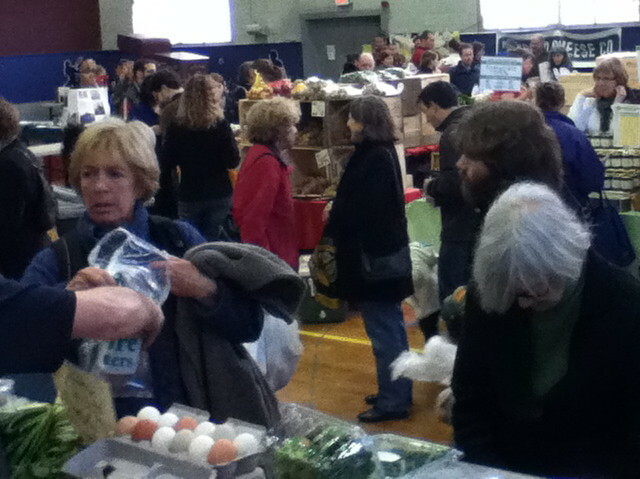 Then Somerville started a winter market last year, but somehow we never made it to the first season. This year, there’s two winter markets, and last Saturday, we actually went to the opening session of the Cambridge Winter Market. I was so impressed by how crowded it was, it occurred to me to whip out my relatively new iTouch and take some pictures. (I’ve had it a couple weeks, and I’m still getting used to having that handy.) As you can see, the camera did a little better in this environment than with the hawks. Oh, awesome! We do a seasonal share at the Newton Community farm and a winter share, but it just ended and I’m running out of local root veggies. Glad I could spread the word.